The tradition of giving gifts to wedding guests started many years ago with the French Aristocrats as a way to show off wealth and to symbolize the royal standing of a couple within that society. In today’s day the idea of “showing off wealth” might be a little intimidating, but the modern wedding favour is nothing more than a little something to say “thank you “ from the bride and groom. When deciding on wedding favours you will again be faced with an infinite list of things to choose from as there are no rules on what the favour has to be. It seems that edible favours are the most popular choice, as well as trinkets etched with the names of the new married couple, but you could literally choose anything you like. Here are a few cute ideas that you might like to think about. Most hobby craft or material shops sell little drawstring bags in a variety of colours. Pop in a couple jelly beans and add a little “thank you” tag with your names and wedding date and you are done. Of course it doesn’t have to be jelly beans. Any small candy will work. Visit a store that sells bulk candy and you will most likely be able to find something that matches your colour scheme. 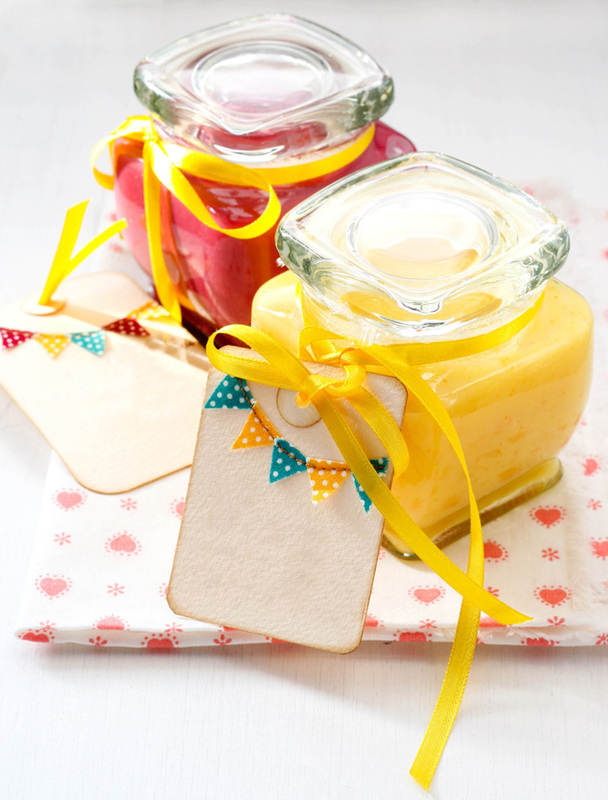 Contact a place like “Berry Nice” and ask them to make up a bulk batch of small jam jars. You can then label them with pretty labels. The same thing can be done with honey. Have some envelopes made with recycled paper (in the colour of your choice) and place a few flower seeds inside. This is a cute way to have your day live on a little longer as guests can simply plant the envelope and watch the flowers grow. And don’t forget that seeds are symbols of fertility and success. Pretty much any flea market you ever go to will have a guy selling “African Wares” and if you look carefully it is quite likely that you will find that he has some heard-shaped stones. These stones are flat with a dent in the middle big enough for your thumb, and basically you are meant to rub the heart for stress relief. So this one sounds a little nuts but bright green apples can look especially effective on a nicely decorated table. If a plain apple strikes you as a little too unsophisticated then perhaps a toffee-apple would be more appealing. Again you’ve got something simple but done right it can look really great and they are kind of funny to eat so you’ll give your guests something to giggle about. Have a chat with a graphic designer and have some fun designing your own personalised “thank you” bookmark. You could put a poem on it or a photograph or even a cute little doodle. The options are endless. When it comes to wedding favours absolutely anything goes. In fact…you should remember that about all aspects for your wedding. Short of human sacrifice, you can pretty much do anything you want!